但開啟Word 2011後 CWYW工具列卻遲遲不現身, 該怎麼辦呢 ? 請用以下標題在Search Support Knowledge Base for EndNote articles檢索, 可看到原文. Word 2004: The simplest way to get the tools to appear is to open EndNote, and go to the EndNote menu. Select “Customizer” from the EndNote menu. Check the box in front of the “Cite While You Write” option. Click next until the Customizer is finished. Open a library. Then open Word and check the Tools menu for the EndNote submenu. There are two files you need to create an Alias of them in your Word startup folder. Change the name of the alias files to have the same names as the original files. Normally, the word alias is appended to the name and should be removed. Open EndNote and a library, then open Word, and the tools should load as expected. This entry was posted in EndNote, 搭配Word_(CWYW、Output Style) and tagged CWYW, EndNote. Bookmark the permalink. Q: How can I get the Mac EndNote X4 CWYW commands to appear in Microsoft Word 2011 under the Tools menu? A: Make sure you have the EndNote X4.0.2 update installed. Once updated, the “About EndNote” screen should read Build 7031. You can download the EndNote X4.0.2 Update here. The simplest way to get the tools to appear is to open EndNote, and go to the EndNote menu. Select “Customizer” from the EndNote menu. Check the box in front of the “Cite While You Write” option. Click next until the Customizer is finished. Open a library. Then open Word and check the Tools menu for the EndNote submenu. EndNote X4: Applications:EndNote X4:Cite While You Write. 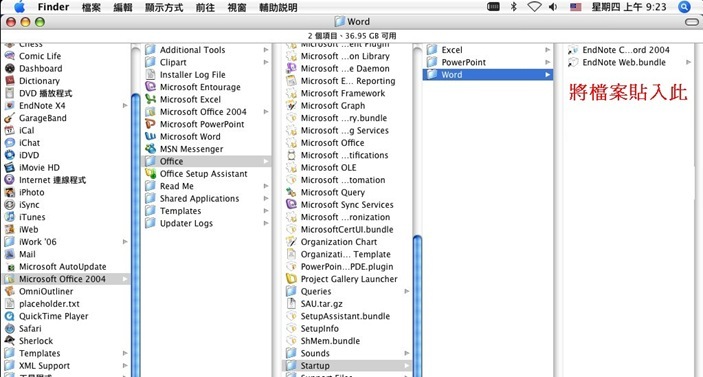 Note: In non-English versions of Word, the folder named “Startup” may be called “Start” or be in the localized language of Word. Click “OK” and close Word. Start EndNote and then start Word.